Roger Federer has agreed to play in the grass-court tournament in Stuttgart for the next two years, which would take his playing career at least halfway through 2017. The June tournament switched from clay this year to open the extended grass-court season and is a key warmup event for Wimbledon, where Federer is seeking a record eighth title. "Playing Stuttgart after clay season and before Wimbledon is great. As you know, I like to try something new, so I am curious to see what will happen in Stuttgart. I watched the first edition last June on television, it had a great atmosphere. I've always wanted to play Stuttgart, but it was always the wrong time after Wimbledon. Now that they've moved dates, the chance to play it is very exciting. I can't wait," said Federer. The seven-time Wimbledon Champion is a fan of the new, extended three-week grass run-up to the Grand Slam. "It's great to have an extra week, It doesn't sound like much, but for us players it's a lot. I love playing on grass. To play another tournament on grass is great for me. I can manage my energy and schedule. It's all about winning titles." Tournament director Edwin Weindorfer commented, "With the appearance of Roger Federer in the next two years, we will expand into new dimensions with the MercedesCup. He shaped the sport of tennis like no other player on the international circuit. He has the highest approval ratings and is a huge attraction for fans around the world thanks to his superlative tennis. We are pleased that we can mark the 100th anniversary of Weissenhof tournament with tennis and sports idol Roger Federer playing the MercedesCup in Stuttgart 2016." 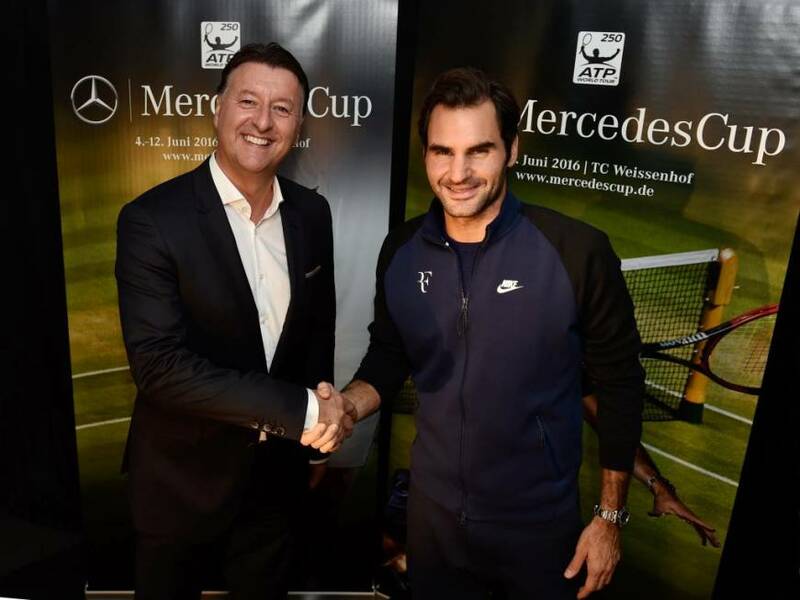 Dr. Jens Thiemer, VP Marketing Mercedes-Benz Cars, said: "The participation of Mercedes-Benz ambassador Roger Federer at the MercedesCup in 2016 is a very big win for the Weissenhof especially in the 100th anniversary of its existence. This again shows the enormous appeal of the Stuttgart tournament's switch to grass last year. The MercedesCup serves players as a first-class preparation for Wimbledon." The 34-year-old Federer had previously said he was already planning for 2017, deflecting questions about eventual retirement. Federer is playing at the ATP World Tour Finals in London this week, advancing to the semifinals after winning all three of his group-stage matches.